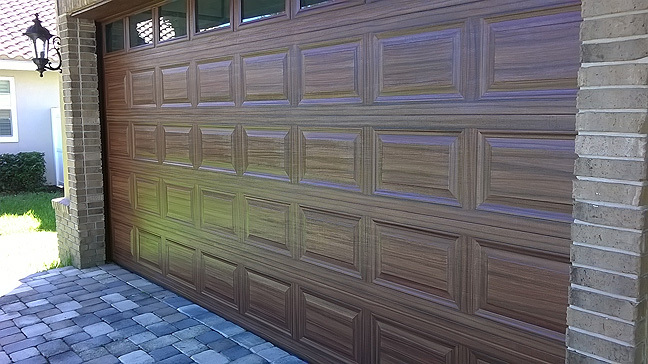 I painted this front entry door to look like wood and to match the garage door I had painted to look like wood earlier in the week. The big challenge on this entry door is the 21 small panels. After cleaning the door really well, priming it and then applying the base coat of paint I taped off the 21 individual panels. The next photo shows why I use so much tape in my painting projects. Getting the small panels painted without getting any paint on the surrounding areas would be impossible so better to just tape it off. It looks like a messy process because it is. The panel on the left has the first coat of wood grain color paint applied. The middle panel has the second coat and the third panel is the finished look. The next photo shows a panel after the first coat of wood grain color and then if you notice the darker lines that is the first pass with the second wood grain color I am using. The base coat paint on this door is a SW color called Toasty. 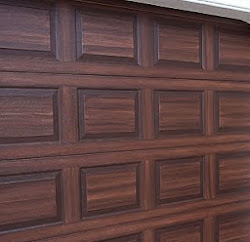 The first wood grain color is Fiery Brown and the second wood grain color is Black Bean. The next photo shows all the panels done and then I took off the tape that was on the vertical areas between the panels getting that ready to paint. This next photo is a great shot of how well the taping off works. I have finished the vertical areas and then taken off all the tape. I only need to create the wood grain effect on the horizontal areas between the rows of panels to finish the center of the door.. The last step was to paint the perimeter area around the door and then seal it with an acrylic UV sealer clear coat. The door came out great and now the front door and the garage door match which really gives a great look to the front of the home. WOWW! That looks amazing and you did such perfect job! I would never have the patience but it's very inspiring! Thanks Kate, it does take some patience for sure.